Nature-based solutions are becoming recognised as amongst the most sustainable and cost-effective approaches towards coastal flood and erosion risk reduction. So far, however, such solutions have not been widely implemented. The quantifiable demonstration of benefits has been lacking and it is clear that coastal managers and engineers need trusted and practical tools that provide them with the desired quantitative information on key flood hazard parameters. The FAST project (Foreshore Assessment using Space Technology) has developed the MI-SAFE package to help meet this requirement. 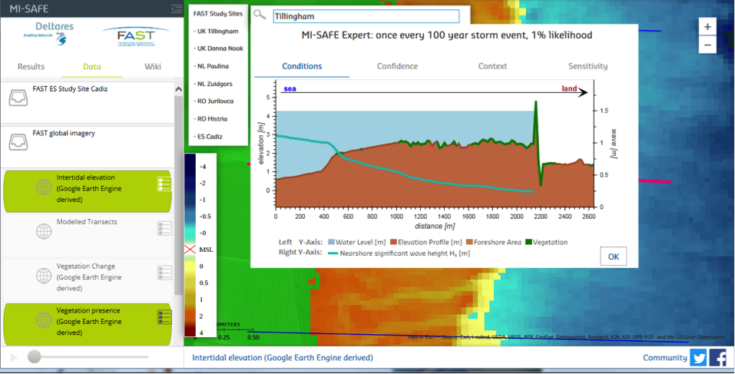 MI-SAFE is a combination of Earth Observation information and numerical modelling, packaged into open source and online products and services that demonstrate how coastal vegetation and foreshore areas can contribute to meet flood risk challenges. MI-SAFE information is based on the latest satellite sensor technology and big data analysis capabilities. The MI-SAFE package combines existing and new earth observation data for coasts worldwide to estimate the contribution of vegetated foreshores towards coastal flood and erosion risk reduction. The MI-SAFE viewer gives a quick indication of the extent to which vegetation, when submerged during high tides, surges, or other high water level events, prevents coastal flooding and erosion. It does so qualitatively also for areas with little or no local data, drawing on open global sources of information. For locations for which more data is available, advanced services can provide specific quantitative information upon request. The MI-SAFE package works as a platform of services supported by a team of international experts. It delivers the capacity to explore multiple ecosystem services provided by vegetation and to incorporate these into coastal flood/erosion risk management decisions anywhere on the world’s coastlines. In this webinar, the MI-SAFE team of experts (i.e. the FAST team) will explain the science behind the MI-SAFE package, the resources that this package of services offers, and the access routes for a range of user types.